From KSAT in San Antonio, Texas. [North East Independent School District] spokeswoman Aubrey Chancellor said sunscreen is considered a medication, something children need a doctor’s note to have at school. These are the best of the best we have teaching and administering our schools? One of my god-children has an allergy to certain types of sunscreen. She was well-aware of her own situation even before she started school. We were aware, the family was aware. It’s not rocket science people. “Where do you draw the line?” she asked. “Do we say no hand sanitizer? Do we not allow school glue? Now – of course – there is a work-around. 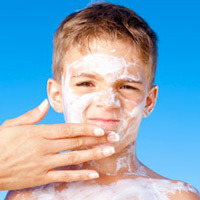 Since some kids do require “medication” at school, parents can present a doctor’s note saying the kid should be allowed to reapply sunscreen during the day if he or she is outside. But do you think the kids would be allowed to take care of this task themselves? Oh no, it must be supervised to ensure no other children comes in contact with the toxic substance. It should probably be controlled and applied by a [union] professional earning a “living wage” for their family of four. Common sense … being destroyed day-by-day in America. I’m sure a tube of chap stick coud be considered a weapon and hazardous. How did I ever live into my 60’s. Actually medication can only be administered in most schools by the school nurse.